Возможна комплектация куполом из стеклопластика любого цвета выбранного по каталогу. Либо самостоятельное строительство крыши со стропилами, сеткой и поверх нее черепица, кровля или какие либо аналогичные материалы. Комплектация пол со ступенями: + 69 200 руб. Dome & floor not included. Haddonstone can create a classical temple using cast stone architectural components including balustrading, columns, flooring and steps. A cast stone statue or ornament from Haddonstone can be used to enhance a temple or folly. A classical temple can create a focal point in a garden or landscape. Haddonstone Forge has created the decorative wrought iron X5150 Temple Dome, featuring ornate scrollwork, for the L9000 Balustraded Temple. 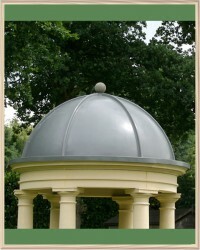 Custom made designs are also available to suit Haddonstone's Small Classical Temple and Large Classical Temples. Glass fibre domes are available in a lead-effect finish for L9000 (X510A), L9100 (X510B), L9250 and L9200 (X510C) temples. These are supplied in sections for assembly on site. A Balustraded Temple or a Classical Temple from Haddonstone can be used as a folly in a residential and commercial project alongside cast stone balustrading, columns, flooring and steps. Haddonstone has a range of garden and landscape structures, often called follies, that can be created using different architectural components including balustrading, columns, flooring and steps. Price quoted is for the wrought iron dome only.